Every so often, I do enjoy a nice pot of chili. I usually make it early in the week so I have a go-to meal whenever I feel too lazy to cook. 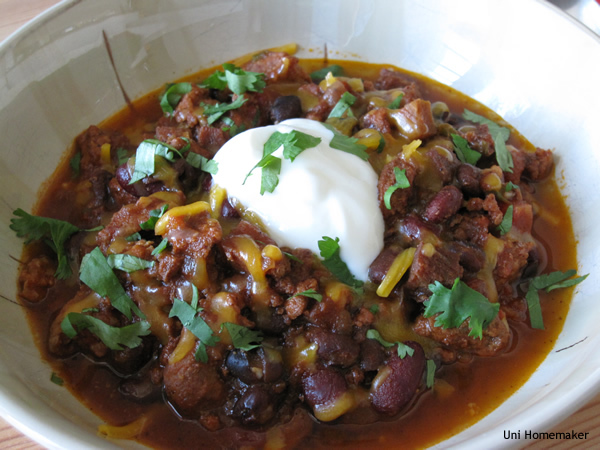 I prefer a chili with multiple kinds of meat —it gives it a nice texture, in my opinion. 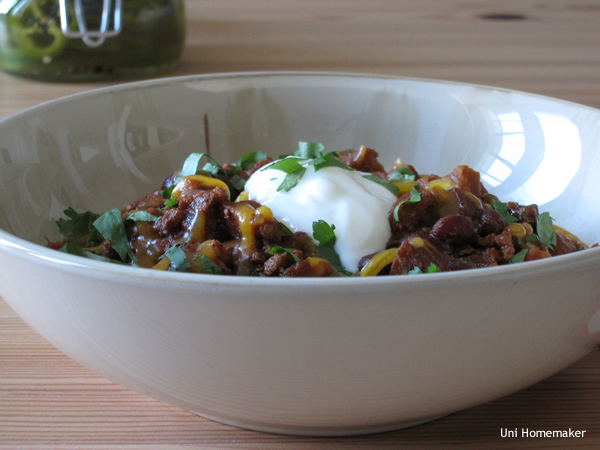 What do you put in your chili? In a large high sided pan over medium high heat, crumble and brown ground beef and sausage. Once it has browned, throw in the ham steak. Then add onion, garlic and jalapeno peppers. Season meat and vegetables with salt, pepper, chili powder, dried oregano, ground cumin and coriander. Cook for 5 minutes then add beer and let it reduce. Turn off the heat and pour this mixture (and your ham steak bone if you have it) into a slow cooker. Then add black beans, kidney beans, tomato sauce, diced tomatoes and tomato paste. Mix well. Let this cook on LOW for 8 hours. 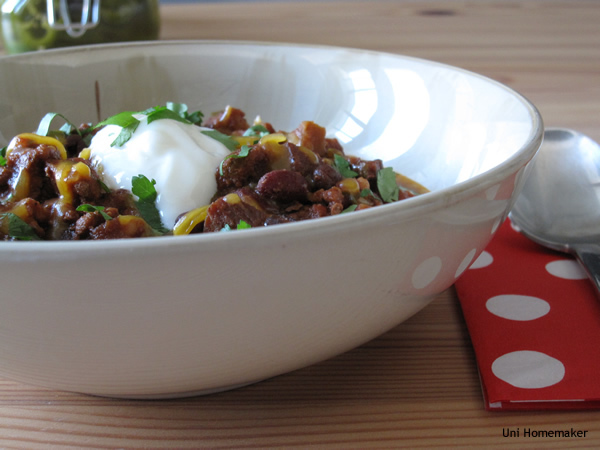 Ladle into bowl and garnish with cheese, cilantro and a dollop of sour cream. My mom used to make chili when I was a kid, one time she used a boned-in ham steak and it was epic! I can’t wait to try this on a hot dog or nachos! Hi Anne, I’m bookmarking this for when it gets a little cooler her in the south east. My husband would love it if I made this for him, especially with the Italian sausage! That’s a favorite in our household. My husband would love it if I’d make it with the spicy sausage that’s for sure. Thank you for the suggestion!